“Situated in a beautiful and fertile valley on the western edge of Exmoor, Combe Martin lies at the center of some of North Devon’s most spectacular scenery. The approach to Combe Martin, along the coastal road, offers the visitor glimpses of some of these stunning views. The two headlands of Great and Little Hangman dominate the scene which greets visitors to the village as they journey down to the pretty sheltered harbour below. 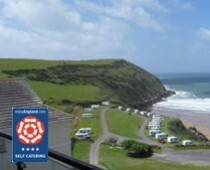 Combe Martin has some of the finest hostelries in North Devon serving the best food and drink and where you will always receive a warm and friendly welcome.” (From the website).